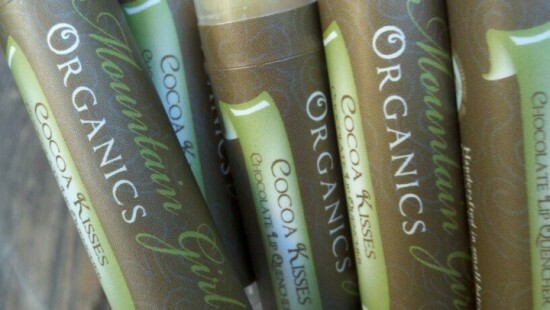 It is hard to believe this is my second season sans Mountain Girl Organics. I do miss it sometimes but am super happy that Paula is doing so well with it! In celebration of Paula and MGO and this little blog up and running again and it being the most wonderful time of the year and all, it is Holiday Giveaway Time! All you have to do is leave a comment on any post here on this blog between now and Friday, December 16th. If your name is drawn, you will be the lucky winner of a handful of hand selected MGO goodies (sigh). Of course, if you don’t want to take your chances, and/or you are searching for lovely gifts for lovely people, you can always go here and order directly from the site. She has completely revamped it and it is gorgeous! 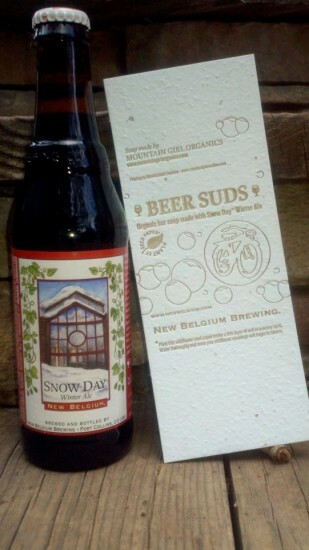 OR, if you are a Colorado friend, you can look here for local shops that carry MGO. Hope you like pictures, because I am finally able to post them again and I have lots to share with you, thanks to my new hosting company, bluehost. So many friends have asked us what it is about Portland that inspired us to actually stay here and rent a place. I am not sure where to begin, so I am going to allow my pics to do most of the talking. 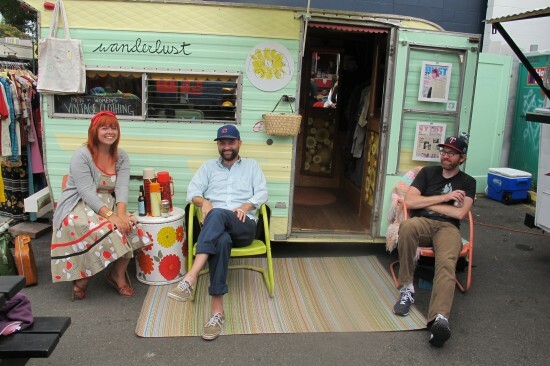 Indie shops are all over NE Portland. 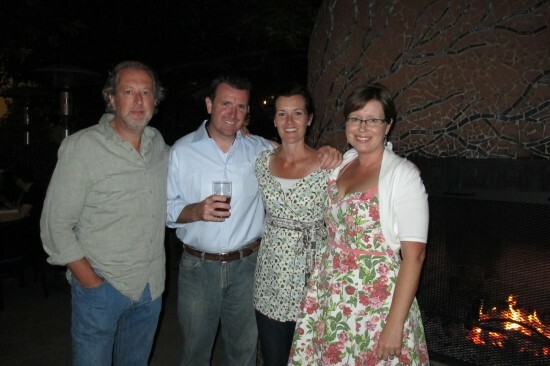 This is a pic of Wanderlust owner Vanessa with her friend and her hubster. Other favorite shops of mine include digs (if you love gnomes, you gotta check this place out) and Tumbleweed, where lots of the clothes are sewn by the owner and one of a kind. Sigh. I could go on but will save that for another post. When you live in a cool city, you are more likely to have friends visit. Not that Nancy and Chad wouldn’t come to visit us elsewhere, but it just helps to live in a cool city. This is us at McMenamins Kennedy School, an old elementary school that now sports a hotel, pubs, movie theatre, etc. etc. It is walking distance from us. Our favorite spot is there is the Detention Room, thanks to the atmosphere and Alex, who tends the bar. 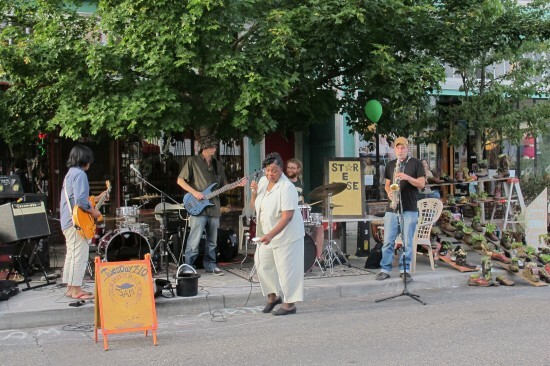 First Thursday is huge on Alberta Street during the summer. Twenty blocks are closed to traffic and it is one big party. Here you see Myrtle singing “You can take my husband, but please don’t take my man” outside the Star E Rose Cafe. There are jam sessions going on here constantly. My little sis came out for a quick visit last month. So happy she hung out with me for a few hours when she could have been hanging out with friends (I am a generation older, after all). 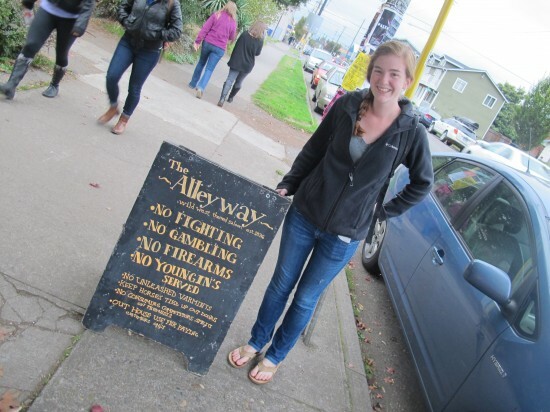 This is her outside the Alleyway. I can’t vouch for it as we haven’t been in yet, but Em liked the sign. We had a yummy meal at Thai Noon, which I can definitely vouch for. Paul and I love it there. So. The food. It is out of this world. I am not kidding. We are walking distance from deliciousness in all directions. I do love a good breakfast, and Helser’s has never let me down. Never. 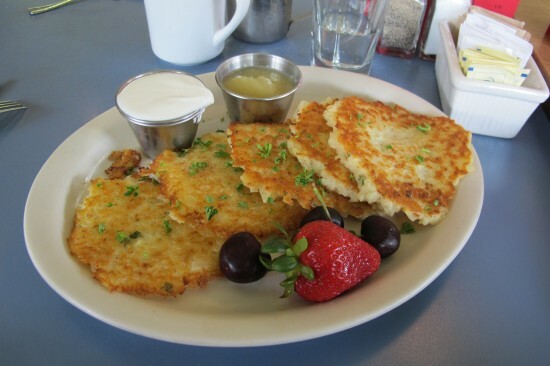 This pic is of their potato pancakes with creme fraiche and applesauce. 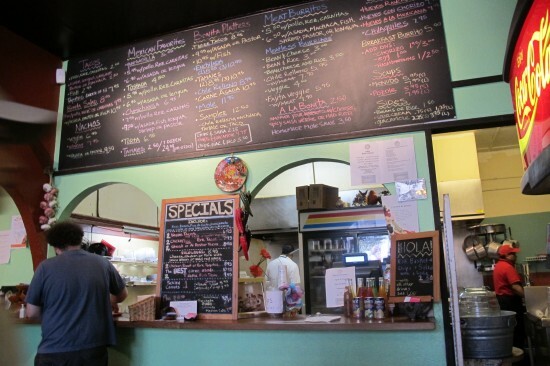 Another favorite of ours is Vita Cafe. I get the huevos rancheros for breakfast and the buffalo tofu wrap for lunch. What you see here is my favorite burrito joint, La Bonita. I grew up on Mexican food and it will always ALWAYS remain near and dear to me. I can make a pretty mean burrito (according to the Brit, anyway) but this place is SO GOOD. I know, I know, I sell Beachbody products for crying out loud. The good news is that there is plenty to do here to stay active. Between meals. 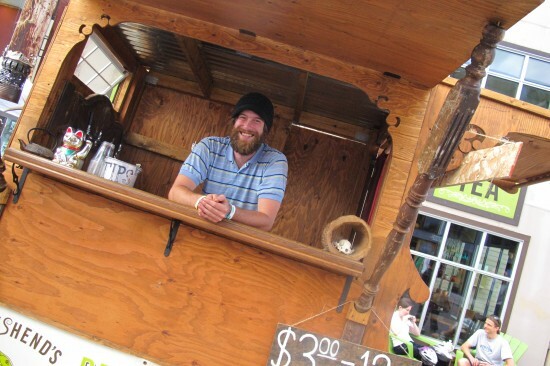 This is Aaron, manning the Townshend’s Tea booth at the Alberta Street Fair. This place has every tea you could possibly imagine. We went to a tea tasting the other day, which was super interesting. Does that make us tea nerds? Whatever. Don’t care. Latest addictions = White Rose Kambucha and Roasted Coconut Mate. And no, I have not lost my love for latte. There are so many great coffee shops all around us. I am *trying* to limit my coffee consumption to the weekends. 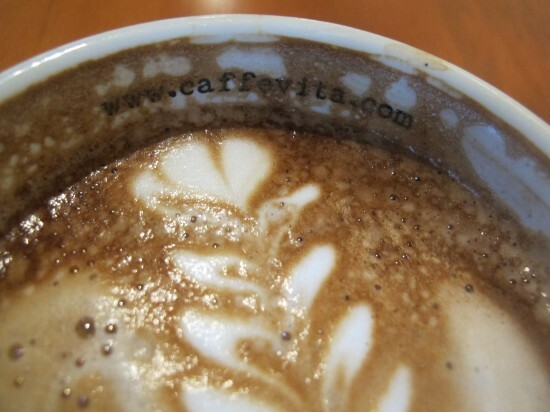 Caffe Vita is one of my faves on Alberta. The baristas are great. I also enjoy fuel cafe and Random Order. Oh, and I can’t wait to try Barista now that their space has been renovated (there was a fire on July 4th). 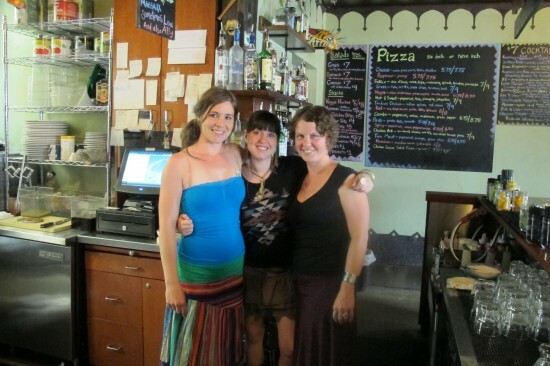 Introducing three of the lovely ladies from binks…Holly, Grace and Ally (you are lovely as well, Dan). This has become Paul’s local. I am sure it has nothing to do with the binkstenders pictured above. Yes, I am rolling my eyes over here. Seriously, though…we love this bar. Next door is another fave, Siam Society, where it is always a pleasure to see Don. He reminds me of a young Leonard Cohen. We also enjoy Bernie’s and Bar Lolo. All of the above are walking distance from our abode. 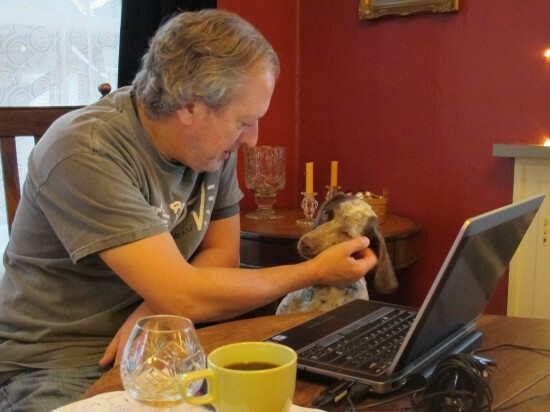 Portlander’s love their pets and we are enjoying our new canine and feline friends. Jonny C brought Charlie over for a photo session the other day. 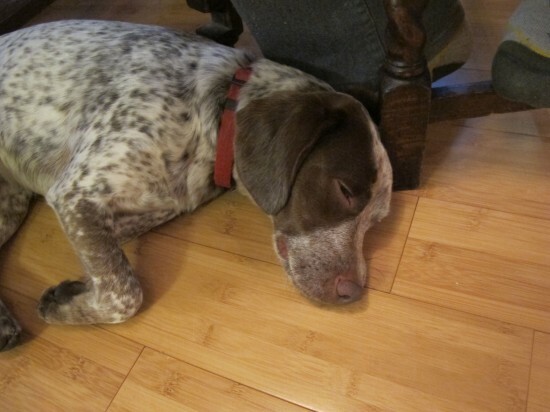 She is a nine month old Beagle/Pointer mix and very sweet. She sniffed all around, vacuumed the kitchen floor for me, ran up and down the stairs and otherwise entertained us for a good hour before conking out at Jonny’s feet. Allow me to introduce Macey. 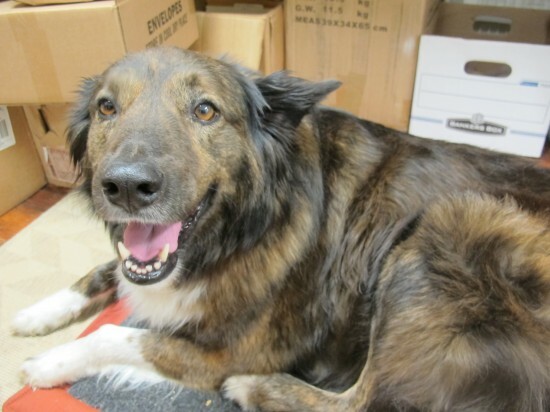 I met her at the Alberta Main Street office. She is the mascot and Sara is her human. I love this pic because I swear she is smiling at me. She let me follow her around and take several photos and of course my two faves of her are in front of the trash cans and the boxes you see here. Macey prefers to keep it real. We have even made a handful of human friends. People say it gets harder to make friends as we get older and I am doing my best to prove that theory wrong. I met Michelle and her hubster Jeremy (see below) at a bloggers meeting set up by Sara, who I met at WordCamp back in September. 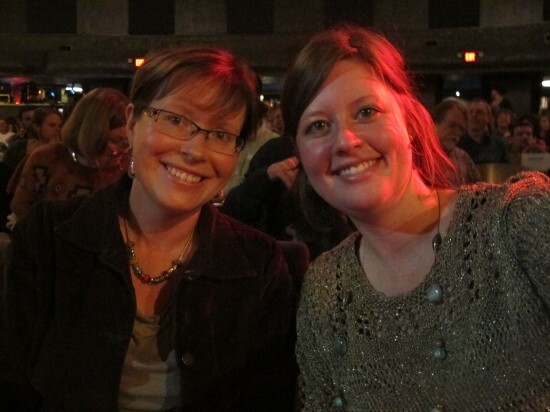 This pic is of Michelle and I at Livewire, which was performed and taped at the Alberta Rose Theatre that night. Besides being world travelers (sigh) Michelle and Jeremy boast some serious culinary skills. Michelle has her own blog, Feed Your Skull. Jeremy is a developer and an all around smart and mellow guy. 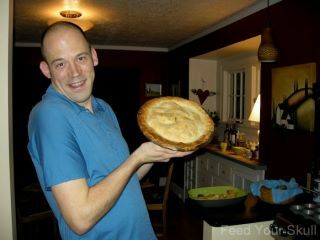 This is Jeremy with his delicious apple pie at our place on Thanksgiving. Thanks for all the yummy meals, you two! 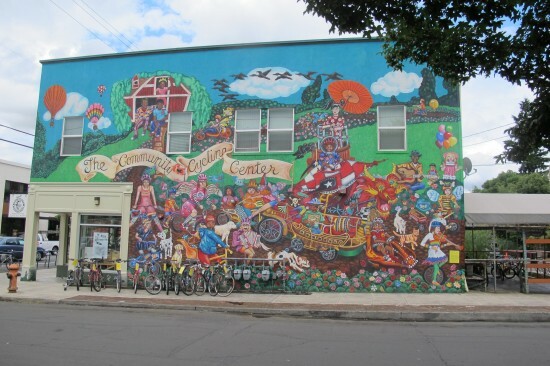 Portland is the land of creatives. One of my favorite places (again, walking distance ~ dangerously so) is Collage. 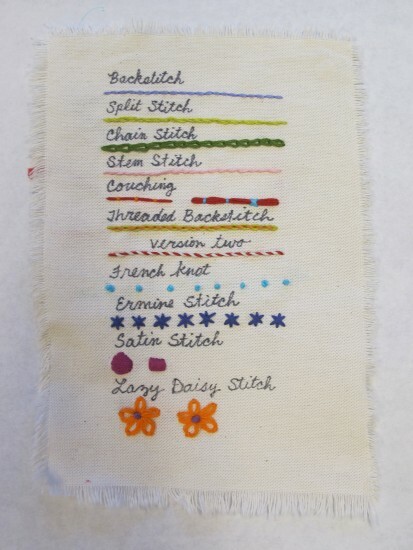 I took an embroidery class there and plan on taking others as well, including bookbinding and encaustic painting. Getting the nerve up for that last one. They have tons of fun stuff for sale, too, including stamps. I gave away most of my stamps when we left Cape Cod (Trish, I hope you are using those stamps!) and am rebuilding my collection, one stamp at a time. I helped out behind the makeshift bar this past Thursday night for a Community Cycling Center fundraiser. This place and the people who keep it going are great. Tomorrow, they will be giving bicycles to over 400 youth across Portland. Watch this short video by Quin, a twelve year old who volunteers for CCC. The sense of community here in Portland is strong all around. 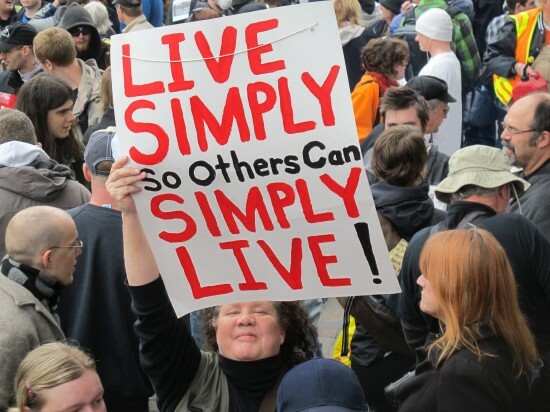 I took this picture at a recent Occupy rally. This woman gave me a wink afterwards. I know there are a lot of people that disagree with this movement. So be it. I find the people involved to be a huge inspiration. 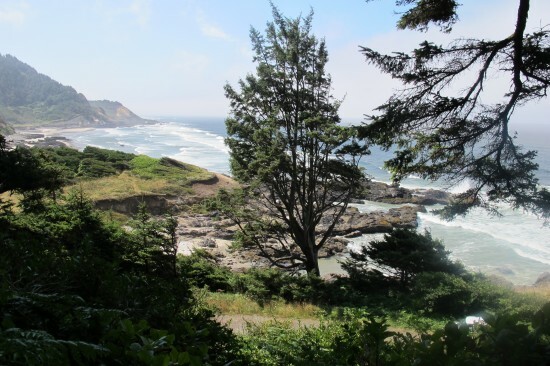 Portland is about an hour and a half away from the Oregon Coast. Life was good back in Evergreen, Colorado but I never did get used to being that far from either the Pacific or the Atlantic. I need an ocean nearby. We had a couple of weeks off of our sit a few months back and spent some time in Yahats at the SeaQuest Inn en route to the Redwoods. That trip was nothing short of magical. 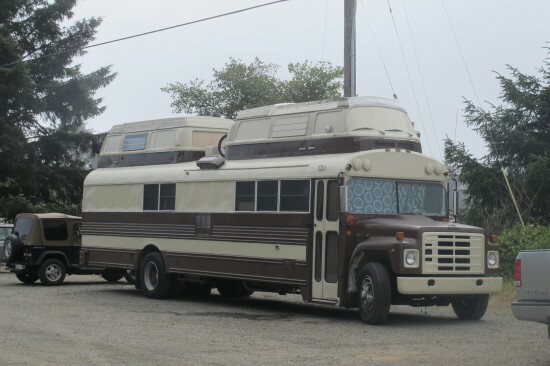 On our way back to Portland from the coast, I spotted this mother of all busses parked along the road. Paul turned around so that I could take a closer look. Since then, I have seen a variety of rolling homes that make my heart go pitter pat. We love living in a place that celebrates individuality.